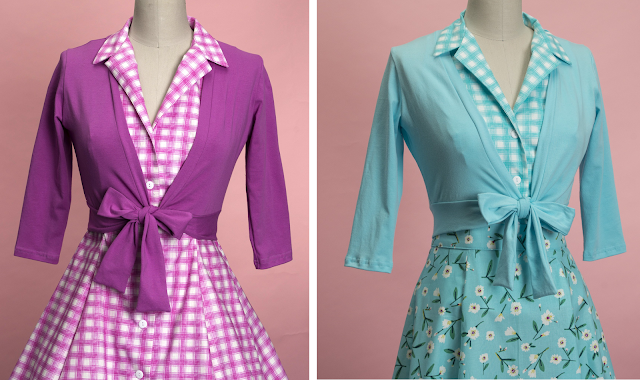 Summer is fully here and I'm inspired by bold bright colours and adorable retro prints. It also feels as thought it's been forever and a day since I've reviewed anything from Heart of Haute! 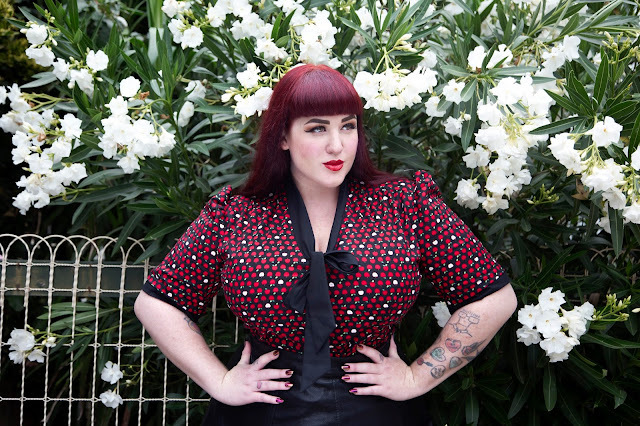 This is far too long between reviews so I've paired up with my girl Brooke Orchard - the best pinup/retro photographer in Australia and reviewed some of my most loved pieces from previous seasons and current selections. A little while ago I would have scoffed at someone recommending I wear both blue and green in the same outfit but now I embrace it. There are many styles at HOH that I adore and I have a special place in my heart for the Estelle Blouse. 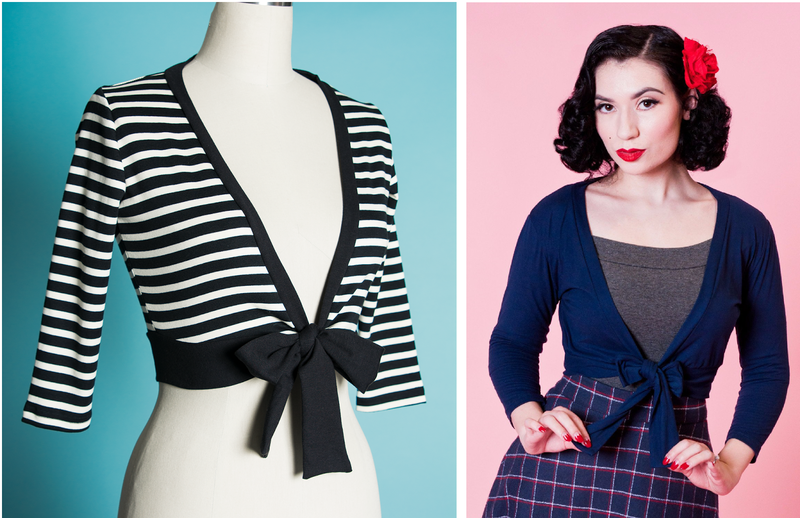 The only blouse I've tried in 5 years that works perfectly with my ample bust and features an amazing bow. I paired the Estelle with this amazing emerald green Sweet Sweater. I have a rainbow selection of this sweater as it's light, stretchy and super flattering. I can wear it all year round and it pairs with so many of my tops and dresses. I wear this sweater in a size XL and I find the fit to be 100%. If you want to wrap this style across the bust more just jump up a size. While this colour is out of stock ﻿can get the following colourways and more online now. More Sweet Sweaters and the best summer wrap dress on planet earth. The Rayleine Wrap Dress is a new style for me and from the moment I slipped into the silky soft rayon wrap I knew I was in love. Now you might have noticed that I have a total of 3 sizes reviewed in different items in this post - why you ask? The answer is simple - different fabrics fit in different ways and our own personal preference means you need to ignore that letter or number and wear what fits you best. I'm wearing the Rayleine in a 1XL and there fit is great. The wrap style means you can ajust the fit to be more or less cleavage and the fabric choice is very flattering for my shape. I was not sure what the actually fit or fabric would be like when I ordered this style and thinking that it was not stretch I opted for the 1XL. The cap sleeve fits comfortably and the neckline and length give this dress a rather 40's feel. As I'm still not 100% brave enough to show my arms in every outfit I model I opted for my burgundy Sweet Sweater. The deep shade pairs perfectly with the pink of the noir roses and really compliments this dress. I'd also love to pair this dress with the plain black Sweet Sweater and create a 3/4 style Rayleine. There are 3 other fabric choices available in the Rayleine style as well so if the Noir is not to your taste then hopefully one of the styles listed above will be. I personally want the black and Posies version in my collection. Oh holy moley I'm soooooo smitten with this print!! Trying a new style once again in the Edie Blouse and I'm absolutely loving it. This adorable little apple print has my heat and the bold black bow and sleeve details perfectly compliment the style. The Edie Blouse is 100% cotton so it's perfect for an Aussie summer and can be styled all year round with adorable swing or skater skirts or even worn casually un-tucked or tucked with jeans. Red Velvet Sweet Sweater - Sold out but you can get a red sweater in a less winter style fabric here. Lastly something a little darker. A lush velvet Sweet Sweater style with the Inspiration top in black - as style I've been dying to wiggle myself into for a year now. A jersey knit of cotton/spandex this top is super comfortable while hugging your waist and bust in a very flattering way. Featuring a point d'esprit dotted sleeve and neckline treatment to show off a little skin and a solid base in the middle of the top. 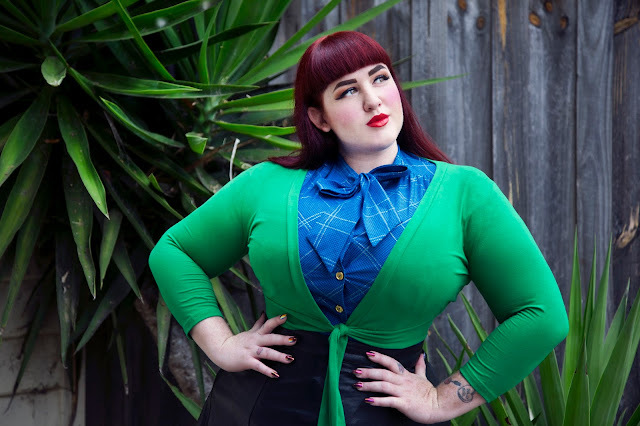 I'm wearing this in a 1XL but I think I could have easily sized down to an XL as the sleeves are super roomy and the bust has lots more give. For the now sadly sold out Red Velvet Sweater I chose an XL but the fabric is not as stretchy as my previous versions. This was a limited edition item for the holidays last year so if it's rereleased I'll be opting for a 1XL. It was an absolute joy shooting and reviewing these items and I'm really glad I tried new styles and found out what size works best in each. Can't wait to shoot even more Heart of Haute this year and give you guys more fit advice. Thank you again to my amazing friend and photographer Brooke Orchard for snapping these rocking shots! I can't wait to show you what else we created. I love Heart of Haute clothing. You look great in all these things. cute your all photo and style.